Bali is an amazing destination that is perfect for your family holiday. But with Kuta and Seminyak filling to the brim with a slew of inhabitants, more and more people are flocking to Jimbaran. Previously famed for its cliff-hugging villas and fresh seafood, more and more establishments are cropping up in the area to serve all kinds of travelers. Could this area be the latest hip spot in Bali in the near future? Follow us, as we unearth the best Jimbaran has to offer. The smell of fresh seafood will make your mouth water as you patiently wait for your order to be grilled to perfection. At Kedongan Fish Market, you are able to pick your fresh seafood, and then simply visit one of the many stalls that helps you cook your fish before you can finally eat your catch on the shores of Jimbaran beach. 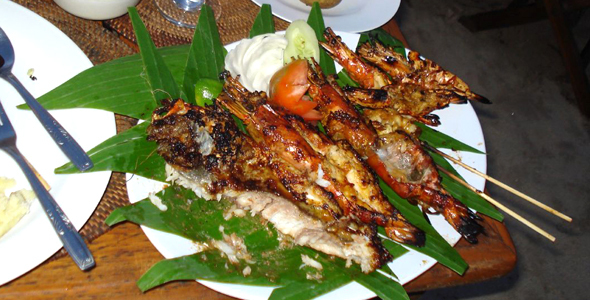 The freshness of seafood and price on offer, a portion of the usual restaurant price, will leave you craving for more. A homey and friendly spot where good times and good food reign – this is the philosophy behind PEPeNERO’s rich taste. This little Italian trattoria has now expanded and even has branches in Jakarta. But the team behind the success has not let that gone to their heads, PEPeNERO is still a cordial trattoria serving some of the best creamy goodness of Italian cuisine. Try out their daily special, and be prepared to fall in gastronomical love all over again. 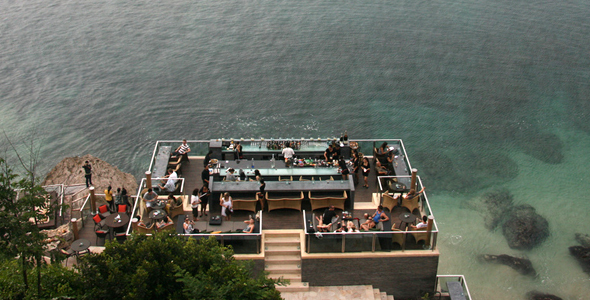 Perched on jutting cliffs blessed with breathtaking views, and with the live music stage roosted atop a natural rock that is part of the cliff itself, the Rock Bar is an amazing feat of architectural engineering. Add to that the innovative ways of drinks and food presentation, the Rock Bar is currently the place to see and be seen, and to enjoy that magnificent Balinese sunset as you groove to the music. Nestled below rugged cliffs, placed atop soft white sand, with beach-side gazebos scattered across the shore facing the mesmerizing waves of the private beach at Karma Kandara, Nammos Beach Club not only offers a heavenly setting, but also a savory Meditteranean and pan-Indonesian cuisine all day long. Check out their international DJ events and twilight screenings of old-time favorite flicks. Photo credit – Purple Butterflyons vary from Ian Fleming 007 Martini to Menehune Martini, and other martini mixes in between with equally interesting monikers. Definitely the place to style your suit up and mingle with other agent in training. A good dose of sea kayaking will do your mind and body well, and Jimbaran has some of the best kayaking spots on the island for you. During the guided kayak tour of Jimbaran Bay, you’ll get to explore caves, coves, blowholes and limestone cliffs before finally riding the wild waves on the paddle back to the starting point. Plenty of companies offer tour packages of Jimbaran Bay sea kayaking, so you’ll do well to shop around and get the best possible deal. The Balangan beach in Jimbaran is home to one of the best swells the island has to offer. The great thing for surfers is that the beach is decent, and the break is spread out between 3 peaks, all left handers. 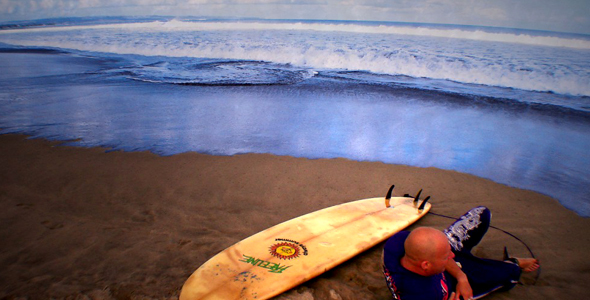 The swells can hold up to 10 feet, so its more for the advanced surfers. 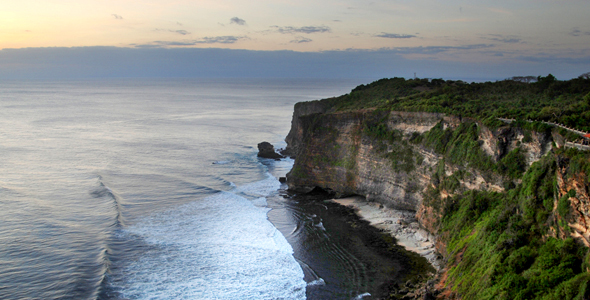 The Pura Luhur Uluwatu is one of the most important temples on the island. The temple is located on top of the eastern-most cliff in Bali, with amazing views of the Jimbaran Bay all around. The temple also hosts a Kecak Fire Dance performance, a traditional Balinese dance based on an ancient Hindu folklore, the Ramayana. Visitors have to beware however, that there are monkeys all around the temple, and they are prone to snatching anything shiny and glittering. Jenggala designs, manufactures and sells stoneware and porcelain ceramics and tabletop accessories. Established in 1976, Jenggala is the foremost producer of quality handcrafted ceramic ware in Indonesia. not only does the compound have a production area, but also a cafe, shop, gallery and workshop space, where the public can take ceramics-making and painting workshops. Their Paint-A-Pot workshops are a fun activity for the little ones, and there are classes for adults too.